NOTE: The Morphlings are owned by Gary S. Carlson. The Morphlings are robots that Vanguard took with him aboard his spaceship as he began a long tour of duty monitoring Earth, protecting it from falling victim to the deadly Tyrrus Combine. These shape-shifting drones assisted the hero in his training sessions and could also provide decoys when necessary. 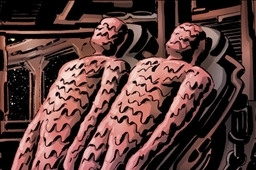 When Wally blew up Vanguard’s vessel to destroy the Tyrrus Combine’s mechanical drones, the Morphlings were all still onboard and were presumably destroyed in the blast.